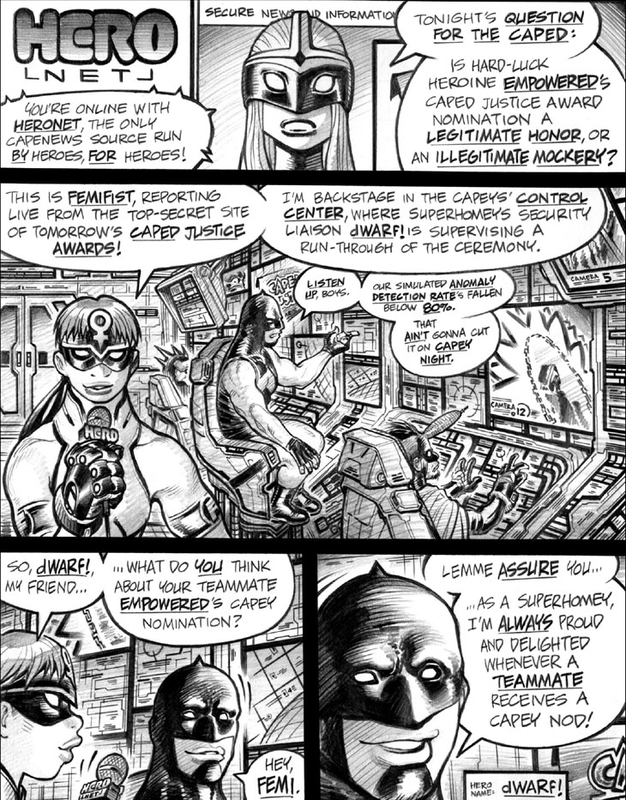 Panel 1: I’ll address this concept further in future commentaries, but the idea, here, is that HeroNet is an informational service for the consumption of superheroes and not necessarily normal humans, though I’ve always been a bit vague as to how much access said “civilians” would have to it. Panel 2: Your guess is as good—or possibly better—than mine as to what the hell might be the “supranym” of that one cape at lower right, the fella with the corn cob protruding from his forehead. The control room’s seats and consoles have a bit of the flavor of Ron Cobb’s designs for the original Alien, perhaps because an incredibly battered and increasingly disintegrating 1979-vintage copy of the excellent book The Art of Alien has been lurking beside my drawing table for (no exaggeration, here) the majority of my time on Earth. In fact, I’m sure that the screen displays with the gridded globes and backgrounds, as seen to the immediate right of dWARf! in panels 2 and 3, are a direct reference to Cobb’s early, sprawling “California split level” design for the Nostromo’s control room. Long-time readers will, of course, note that Femifist—or possibly FemiFist?—recurs as a HeroNet commentator in future volumes. The true nature of her powers remains sadly unexplored, howeva.